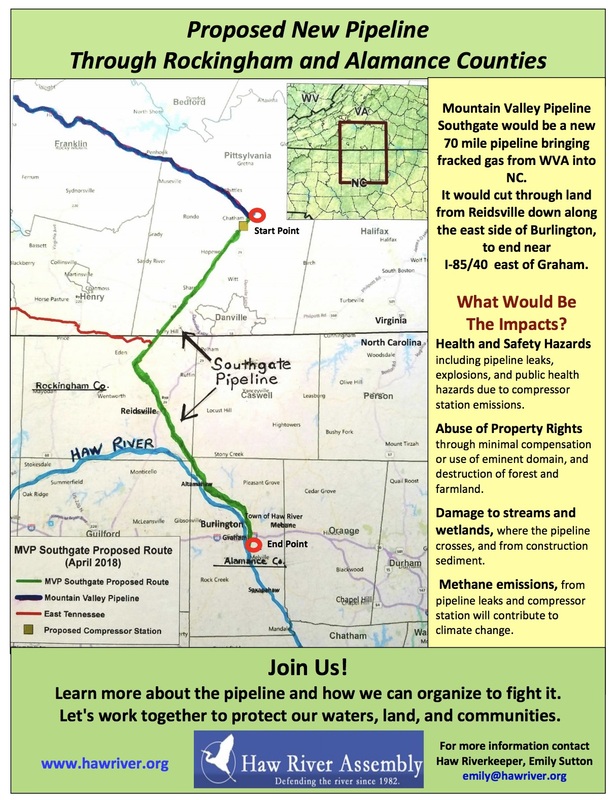 In April, we learned that the developers behind the 300-mile Mountain Valley Pipeline plan to extend the dangerous fracked-gas pipeline through Pittsylvania County, Va., and into Rockingham and Alamance counties in North Carolina, putting thousands more people in harm’s way. Dubbed “MVP Southgate,” the project would carve through 72 miles of private property, farms, fields and woodlands. Learn More. Mountain Valley Pipeline, LLC is planning to build two compressor stations along the extended route — one in Pittsylvania County and one in Rockingham County. These industrial facilities operate 24/7, emitting pollution that poses significant health hazards to nearby communities. Additionally, the compressor stations generate extremely high pressure, up to 1,450 psi, and are prone to explosions. Compressor stations are usually built in rural areas where residents have fewer resources with which to fight the multi-billion dollar projects. 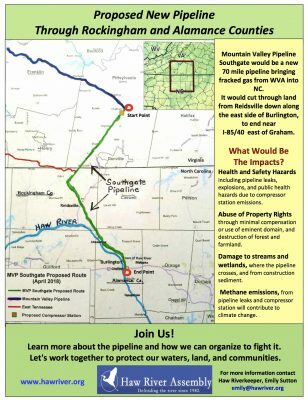 Mountain Valley Pipeline, LLC is hosting a series of “Open House” June 25-28 to receive feedback from residents in some of the communities the MVP Southgate pipeline would traverse. This is a critical opportunity to speak directly to the pipeline developers and express your concerns. Here are the details. Appalachian Voices and dozens of other organizations in three states have fought the unnecessary and risky Mountain Valley and Atlantic Coast pipelines for four years. We do not need another fracked-gas pipeline that would lock us into decades more reliance on dirty fossil fuels, worsen air quality, impact drinking water sources, and threaten the lives and livelihoods of citizens along its path.